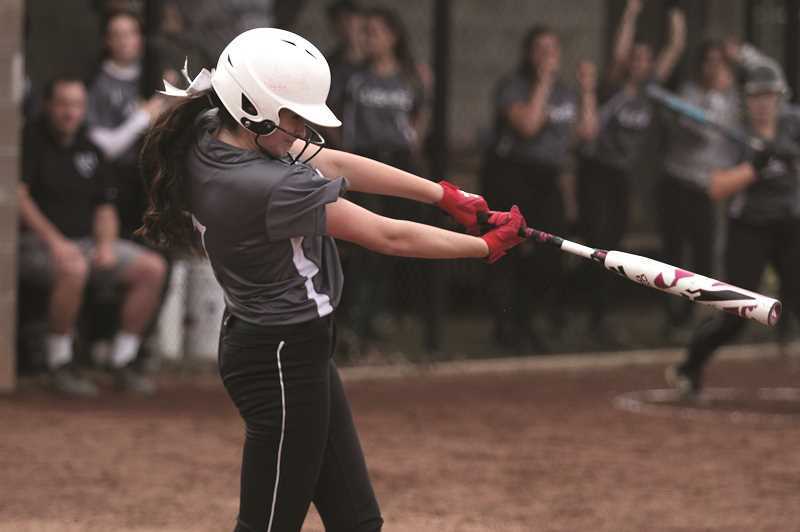 Last week's league opener between the North Marion and Molalla softball teams featured a pair of programs on the rise and looking to turn things around this season. Beginning the Tri-Valley Conference slate with a victory would be a great first step toward achieving the ultimate goal of qualifying for the state playoffs next month. And for five innings, it looked like the visiting Indians were going to come away with the 'W', but an eight-run rally in the sixth inning by the Huskies turned the tide and ultimately gave North Marion a 10-6 win. "It's softball. It ain't over 'til it's over," North Marion head coach Jonathan Santos said. "The girls rallied behind each other and kept each other in the game. I'm a proud coach." Santos coaches club softball during the summer months and was familiar with a number of athletes on the other side of the field coming into the game. The Indians were coming off a six-game win streak that was snapped on April 1 against the defending 2A state champion Kennedy Trojans and looking to pick up where they left off despite facing a depleted pitching staff, forcing first-year head coach Bill Baxter to turn to senior Grace Nelzen in the interim. "Unfortunately right now, we've got a situation where we're really low on pitchers," Baxter said. "It's hard for a young kid who has never pitched before to pitch two games in a row. We're missing a pitcher until mid-April and we had to bring a freshman up, and she's never pitched at the varsity level either." Nelzen pitched admirably in her second game, holding the Huskies to just two runs in the opening inning through the first five innings of play. The Indians stormed back in the top of the second, plating a pair of runs to tie the game at 2-2. Molalla took the lead the next inning when Grace Nelzen sent a ground ball up the third base line, which was bobbled by North Marion's Anna Fuentes, allowing Alison Wickham to score. Molalla took advantage of another North Marion error in the top of the fourth to score two more runs, and a triple by Wickham brought home teammate Tyler Maricich to make it a 6-2 ball game. It was a tough stretch of play for the Huskies, who were outhitting the Indians at the time, but unable to convert their successful plate appearances into runs. Meanwhile, the team's miscues on defense were beginning to add up. "I feel like once the third inning hit, we were all kind of down on ourselves," North Marion sophomore Abby Railey said. Following a scoreless fifth inning, North Marion senior Pascal Powers-Leach opened the sixth with a single ripped to left field. Powers-Leach was thrown out at second on a bunt by teammate Britney Willis, who was in turn picked off at first on a subsequent play. But the Huskies weren't ready to throw in the towel yet. Back-to-back walks from Samantha Baylie and Jasmine Calkins gave the Huskies a pair of runners to work with, and Fuentes made up for her previous error by dropping a line drive to centerfield, scoring them both. The trio started a run of 10 consecutive North Marion batters to reach base on hits, walks or by being hit, turning a 6-2 deficit into a commanding 10-6 lead. Me and Lili walk in and were saying, four runs, all we need is four runs," Railey said on the team's sixth-inning rally. "The hype started building from there. We started singing songs, laughing around, and then all of a sudden Pascal comes out and rips the ball to the outfield. Everything just kept coming into place." "We got one hit, and that led to 10 more," Baylie said. "Once you're already hyped up, it's much easier to stay hyped up." The Huskies finished the game with 20 hits, with every player on the team logging at least two hits. Baylie led the team by reaching base in every at-bat, going 3-for-3 with a pair of walks and two runs scored. "It's a team effort," Santos said. "Everybody rises to the occasion when they were asked." North Marion (6-2, 1-0 Tri-Valley) was scheduled to host Madras on Wednesday and travel to Madras on Friday. Molalla (6-4, 0-1) was scheduled to host Estacada on Wednesday and travel to Estacada on Friday.